Are you seeing a lot of pop-ups that titled with Windows Detected ALUREON Virus ? It is a complete fake that has been created to scare you into thinking that your computer have a lot of heavy problems with security, drivers, malware, etc. 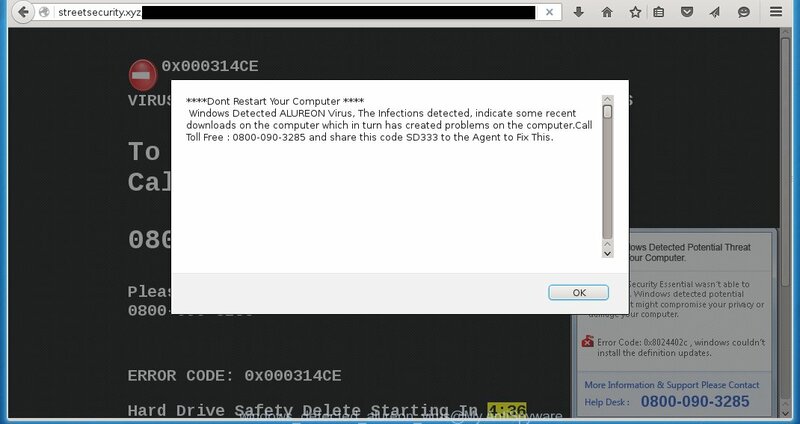 Windows Detected ALUREON Virus, The Infections detected, indicate some recent downloads on the computer which in turn has created problems on the computer.Call Toll Free : 0800-090-3285 and share this code SD333 to the Agent to Fix This. In reality, you have no problems with any drivers, Windows registry or a malware error. So call to Support Help Desk unnecessary anyway. The telephone (0800-090-3285), which is given in the message is a fake tech support service. By calling it, you just lose your money and your time! These “Windows Detected ALUREON Virus” pop-ups are caused by a malicious extension that has been installed by an adware and PUP that usually infects system through the use a free programs such as free pdf creator, free video player, free youtube downloader. So, when you have installed a free software that you need, this adware has been installed automatically too. Most commonly, this adware that shows the fake “Windows Detected ALUREON Virus” warnings is bundled within the installation packages from a free hosting and file sharing web sites. So, to protect yourself in the future, please read term of use and user agreement very carefully before installing any software or otherwise you can end up with another adware on your computer. Get rid of “Windows Detected ALUREON Virus” popups manually is difficult and often infection is not completely removed. Therefore, we recommend you to use the MalwareBytes Anti-malware Free that are completely clean your computer. Moreover, the free software will help you to remove browser hijackers, malware and toolbars that your computer may be infected too. Click Next and follow the prompts. Once installation is complete, click on the “Scan Now” button to start scanning your computer for Windows Detected ALUREON Virus infection. This procedure can take some time, so please be patient. When the scan is finished, make sure all entries have “checkmark” and click “Remove Selected”. Once disinfection is completed, you may be prompted to Restart. To increase your security and protect your computer against new annoying ads and malicious web sites, you need to use an application that blocks access to dangerous ads and web-pages. Moreover, the software can block the display of intrusive advertising, which also leads to faster loading of websites and reduce the consumption of web traffic. After the download is complete, run the downloaded file. You will see the Setup Wizard program window. Follow the prompts. After installation is complete, click “Skip” to close the installation program and use the default settings, or press “Get Started” to see an quick tutorial that will help you get to know AdGuard better. In most cases, the default settings are enough and you do not need to change anything. Each time, when you start your computer, AdGuard will start automatically and block “Windows Detected ALUREON Virus” pop-up ads, as well as other malicious or misleading web page. For an overview of all the features of the program, or to change its settings you can simply double-click on the icon AdGuard, which is located on your desktop. if MalwareBytes Anti-malware cannot remove “Windows Detected ALUREON Virus” popups from your browser, then we suggests to use the AdwCleaner. Also you can ask for help our Myantispyware team below. Double click the AdwCleaner icon. Once this tool is started, press “Scan” button to perform a system scan for Windows Detected ALUREON Virus adware. If you are seeking a help for adware and malware removal, then follow these steps. Copy and paste the contents of the HijackThis log into your post. If you are posting for the first time, please start a new thread by using the New Topic button in the Spyware Removal forum. When posting your HJT log, try to give us some details about your problems, so we can try to help you more accurately. Wait for one of our trained “Security Team” or Site Administrator to provide you with knowledgeable assistance tailored to your problem. The following instructions is a step-by-step guide, which will help you to remove the “Windows Detected ALUREON Virus” adware manually from Mozilla Firefox, Internet Explorer, Edge and Google Chrome. It will open a list of all programs. Scroll through the all list, and uninstall any suspicious and unknown programs. When breaking into a computer, this adware may also change a desktop shortcut for Chrome, Firefox and IE. Due to this, every time you start the browser, it will open an annoying web-site. To clear a browser shortcut, right-click to it and select Properties. On the Shortcut tab, locate the Target field. Click inside, you will see a vertical line – arrow pointer, move it (using -> arrow key on your keyboard) to the right as possible. You will see a text that has been added here. You need to remove it.